Soweto (South Africa) (AFP) - Thousands of mourners flocked Wednesday to the heart of South Africa's sprawling Soweto township, a centre of anti-apartheid resistance, to pay tribute to Nelson Mandela's former wife and struggle hero Winnie Mandela. Her grandson Bambatha Mandela described Winnie, who died on April 2 after a long illness, as "an extraordinary woman, a mother, a soldier, a fighter". "Even at 81 (she) was one person I thought would live forever," he said in an emotional tribute. "I had the privilege of being the first grandchild they could raise after (Nelson Mandela) returned from prison." The choice of Soweto's 37,000-capacity Orlando stadium for both the memorial service and the full state funeral planned for Saturday was highly symbolic. Unlike many struggle-era leaders who moved from townships like Soweto to formerly white suburbs after apartheid fell, Winnie Mandela remained embedded in the community where she met Nelson Mandela at a bus stop in 1957. "I don't think I want to wake up alongside my enemies," Bambatha remembered his grandmother as saying. 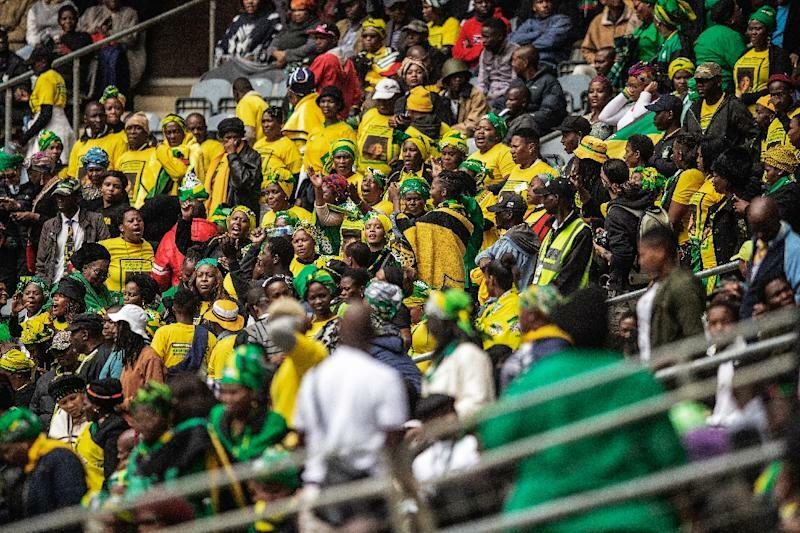 Sunshine broke through a dense cloud cover over Soweto during multi-faith prayers, while outside the stadium a motorcycle club sporting African National Congress (ANC) colours arrived to pay their respects. "I had seen her, I was here in 1974 when she came to the schools and said we were marching out. She was a hero for us, a fighter with us," said mourner Lilian Motgung from nearby Zakariyya Park. Inside, the Soweto Gospel Choir sang several rousing numbers which prompted mourners to stand and dance beside their plastic foldaway seats. Deputy President David Mabuza said that many South Africans were left "weeping" after learning of her death. "Though you are gone from our human eye, the black fortress of human dignity cannot be erased. "You reminded our daughters and mothers that they are powerful beyond measure. "You are a torch-bearer of our liberation." The charismatic master of ceremonies cried "Long live the fighting spirit of Mama Winnie Madikizela-Mandela", and "Viva Soweto!" to spirited chanting from the crowd. "Every time we met Mrs Mandela, she'd tell wonderful stories, she was like no other," church leader John Moletsane told AFP as he made his way to the ceremony. "She would tell you about how to build the future and not look to the past. I don't know where South Africa would be without her -- no one can fill her space." Rita Ndzanga, a frail former anti-apartheid fighter who was detained alongside Winnie Mandela, drew rapturous cheers from the crowd as she spoke about their experiences together. "I remember when we were arrested in our fight against pass laws for women," she said, describing how they were both breastfeeding at the time. As well as numerous ministers, religious leaders and family members, George Bizos, an anti-apartheid icon who was close friends with Nelson Mandela, also attended. He sat alongside at least 100 VIP delegates including Nelson Mandela's third wife Graca Machel on a black stage decorated with bright yellow and white flowers and flanked by two big screens. Mananki Joyce Seipei, the mother of a boy whose kidnapping Winnie was convicted of in 1991, was reportedly encouraged by the ANC to attend Wednesday's event. She told local media she was "very sad to hear that Winnie is no more because she and I had made peace". Winnie Mandela was found guilty of kidnapping Stompie Moeketsi, a 14-year-old boy who was then beaten to death by her bodyguards in her home in 1988. She was also accused of running a mafia-style gang responsible for multiple murders and beatings in Soweto, and of endorsing "necklacing" -- killing suspected informers with burning tires put over their heads. Her convictions for kidnapping and fraud, and her reputation for overseeing violence in black townships, were brushed aside with tributes to her bravery, independence and integrity. ANC deputy secretary general Jessie Duarte told critics of Winnie Mandela to "sit down and shut up" during her speech to the crowd. 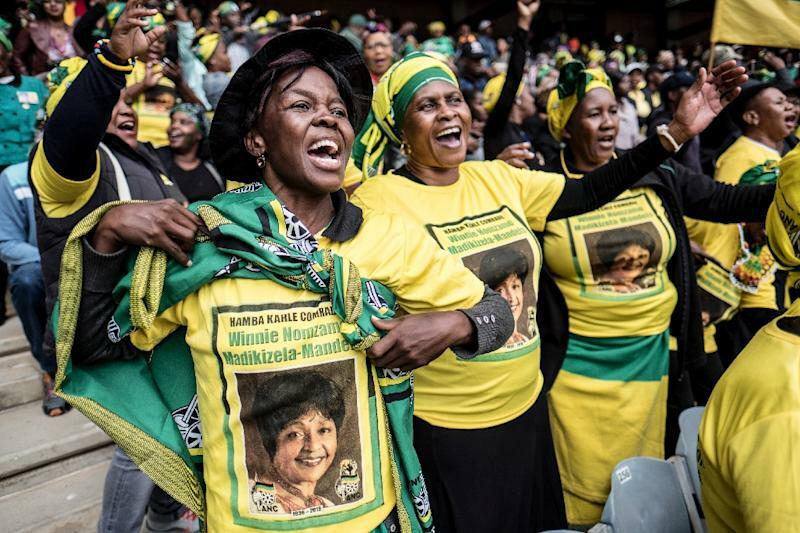 Most of Winnie Mandela's 38-year marriage to Nelson was spent apart, with Nelson imprisoned for 27 years, leaving her to raise their two daughters alone as she kept his political dream alive. Glamorous and tough, she played a high-profile role in the battle to end repressive white-minority rule. In 1990 the world watched when Nelson Mandela finally walked free from prison -- hand-in-hand with Winnie. The Mandelas separated in 1992 and divorced four years later, after a legal wrangle that revealed she had had an affair with a young bodyguard. During her old age, she re-emerged as a respected elder who was feted as a living reminder of the late Mandela -- and of the long and celebrated struggle against apartheid. "She was the best we could have," said one of her young great-granddaughters to an ecstatic crowd response.